These days, many scientists stand unified on several topics, including the defense of science itself. But it’s also good to know that scientists still have a sense of humor, and that some scientific debates can be entertaining, educational, and accessible, all at the same time. Enter “Birds vs Fish”, an ongoing feud largely played out on Twitter, that certainly scaled up and ruffled some feathers last week! While birds vs fishes has surely been argued prior to social media, the recent debate stemmed from friendly trash-talking between Patrick Doran (avid Aves supporter), and myself (garrulous fish fan) in 2015. Fellow scientists of both persuasions joined the fray over the years, with Luiz Rocha catalyzing the recent campaign. As fierce avian and fishy tweets fired back and forth, several fun facts were garnered from the exchange; all while learning that fish are obviously cooler than birds. We’ll review some of the highlights, and be sure to check out #BirdsVsFish on twitter as well. Number of species: It’s estimated there are over 28,000 extant species of fishes, compared to approximately 10,000 extant bird species. We should also note that biomass is on our side too; it’s believed that the Bristlemouth fish is the most abundant vertebrate on the planet (hundreds of trillions)! To the ends of the Earth…and beyond: There are plenty of birds that can swim and several fishes that can fly. 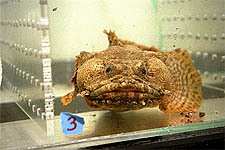 But when it comes to extremes, the deepest fish is found over 5 miles down, and the highest-flying bird about 7 miles up. However, several fish species have been sent into space (e.g. Toadfish, Medaka), whereas birds apparently don’t have the guts. Birds of prey: A popular angle of the avian versus ichthyofaunal discourse is who can eat the competition. Google search results seem to tip in favor of birds eating fishes left and right, but some fishes do turn the tables, and more instances are being captured on film. Popular examples are giant Wels Catfish that learned to eat Pigeons, Northern Pike “abducks” Mallard, and African Tigerfish that leap from the water to catch swallows mid-air! Piscine palette: The recent flare-up in the heated fins versus feathers debate was ignited by a comment suggesting fish couldn’t hold a candle to birds in terms of colors and pattern. I’ll always advocate for the underappreciated diversity of freshwater fishes (check out darters), but I immediately thought of Luiz Rocha’s stunning marine fishes images, and he didn’t disappoint! They’re ALL fishes! Fishes essentially won before the debate started. Evolutionary relationships indicate all tetrapods (four-limbed vertebrates including amphibians, reptiles, birds, and mammals) stemmed from a group called “lobe-finned fishes” (aka sarcopterygians), which include lungfishes and coelacanths. Evolutionarily speaking, tetrapods are a branch of lobe-finned fishes, so birds are fishes, and this whole debate was actually fishes versus fishes! In the end, it was agreed that there were very fine species on both sides; ornithologists, ichthyologists, and people caught in the middle enjoyed learning something new about biodiversity, as well as taking pride in their study organisms and favorite animals.